The aliens known as the Hek have destroyed the Earth. What little remained of humanity constructed a new military base, located in a region outside of our space-time, known as the Breach. From there they launch their attacks on the Hek in the past in order to save the future. 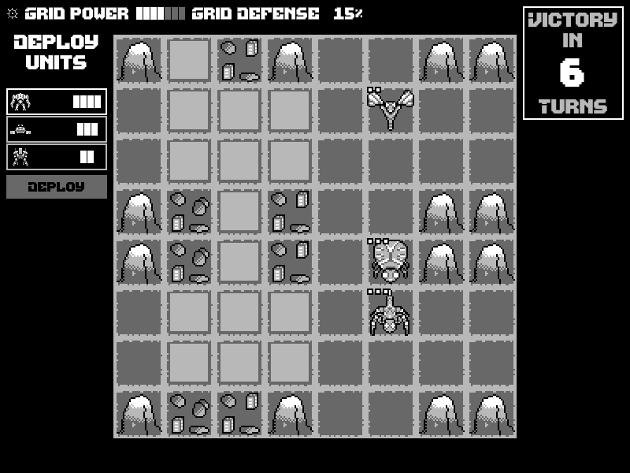 A (bad) demake of Into the Breach. One playable level, three mechs and three enemy unit types. The font used in the game is Endamage SF, created by somepx.itch.io. Don't put yourself down, this is an excellent de-make! I've played a lot of ITB and found this to be an excellent counterpart, good job! Hey, thanks for the comment! I guess I'm just a bit frustrated that I didn't manage to include some of the mechanics ITB had (like webbing units) or had to rush some in order to get it done in time. All in all, I'm pretty happy with how it turned out. Glad you liked it!